(Nanowerk News) Optical materials serve a major role in modern sciences and technology. Many of the devices we use feature technology resulting from material discoveries in this fast moving area of research. Nowadays, the need for more efficient devices and minimisation in optoelectronics requires a novel approach towards crystal engineering of functional solids. A solution can be multicomponent materials built from either organic or mixed organic and inorganic components selected in a specific way, to combine molecular and structural properties to form a 3D architecture. Optical properties of a crystal strongly depend on two factors, i.e. the spatial distribution of molecules in the crystal structure and the electronic properties of molecular building blocks. The latter are easy to predict whereas the former are not. Crystal symmetry is often a key to obtaining a desired property. Noncentrosymmetric crystal structure (chiral/polar) is a necessary (limiting) condition for such properties as nonlinear properties of even order and linear properties like optical activity, piezoelectricity, pyroelectricity and ferroelectricity. However, fulfilling symmetry rules does not guarantee the existence of a physical effect. The choice of building blocks is crucial; in ideal cases, push-pull molecules should be linked with constituents enabling synthon formation flexibility. Active pharmaceutical ingredients (APIs), through their favourable donor/acceptor spatial distribution and synthon formation flexibility, are attractive building blocks in modern materials crystallography. An API is a substance or a mixture of substances used in the manufacture of a drug product and which becomes an active ingredient in the drug product itself. Here, a Polish scientist (working in Professor Katarzyna Stadnicka's group at the Jagiellonian University in Kraków) presents design strategies for optical materials based on selected pharmaceutical molecules ("Charge density and optical properties of multicomponent crystals containing active pharmaceutical ingredients or their analogues"). Gryl successfully presents the factors that contribute to molecular recognition in the four selected polar/chiral crystal phases. Theoretically predicted optical properties of the molecular/ionic building blocks as well as bulk effects were all confirmed experimentally. This work shows that quantitative crystal engineering techniques combining structural analysis, charge density studies, prediction of properties and their measurements enable the full analysis of the obtained functional materials in terms of their usefulness in practical applications. The study is just a first step in the design of novel optical materials based on push-pull molecules and APIs. This work presents an alternative application for pharmaceutical solids that are of major interest in the pharmaceutical industry. 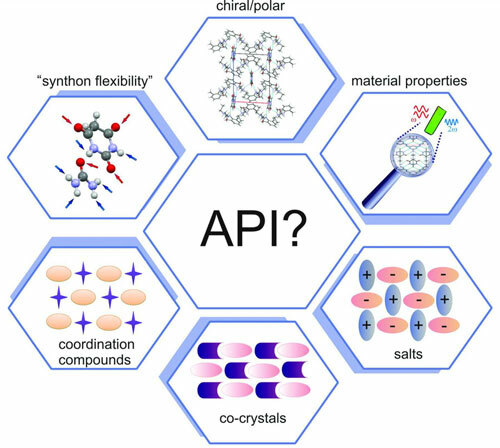 Dr Gryl's journey with optical materials based on API started with three polymorphs of urea and barbituric acid adduct ("Polymorphism of urea-barbituric acid co-crystals"). The co-crystals display synthon polymorphism (a possibility to use the same donor and acceptor sites in many ways) and hence enable the manipulation of the outcome of the engineering process. Why not use the same "flexible" molecules and incorporate them in a lattice containing components with high molecular (hyper)polarizability? This is a next step in Dr Gryl's research. First, of course, as much as possible needs to be known about the selected building blocks and there is no better way than to study crystal structures containing those building blocks.